If you have any further questions, check our FAQ Index first, and if you can't find an answer,Contact us! Becoming a Member It's easy to become a member! You will find all the details about joining us in the FAQ below. If you can't find an answer, get in touch with us! 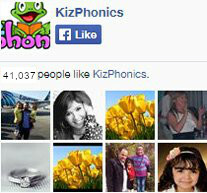 What are the benefits of joining Kiz Phonics? For parents & Home Schoolers, this is a cheap alternative to expensive language school reading programs. Do-it-yourself reading is what we offer you. For Schools, we are a full course or simply the supplement your teaching staff have been looking for.